Barnes & Noble has declared this week, March 12 – 18 – Baby Week. There are some great online sales including baby gifts, parenting books, development toys, and board books. Check out this great sale and start building your baby’s library – or stock up on some great baby shower or birthday gifts. Books are a fantastic way to highlight any gift. Smaller books can be attached to a package with ribbon or a book can help define a theme of a gift. I highly recommend signing any books you give as gifts. We have many board books that we read to our daughter, most we received at my baby shower which had a bring a book theme. I got the idea from an invitation I saw on Tiny Prints which included stickers that you sent along with the invitations. I customized the stickers to say: This book belongs to Olivia. From: _______. My mother always signed books that she gave to people and I have always done the same. When I read a book to my daughter, I always start it be reading to her who bought her the book before she was even born. One of my favorite blog posts was on les petites presents . It talks about interchanging holiday books out of a specific bookshelf. I absolutely loved reading this! I also like to reorganize Olivia’s books on various bookshelves every couple of weeks. Switching which books we take in the car, which we read in her nursery and which we read during the day. Take advantage of the great Barnes and Noble sale this week – and happy reading to you and your family! Reading has always been s huge part of my life and is now a part of both of my daughter’s lives. My mother and father always signed books and even added dates. Tonight I started reading Alice, Through the Looking Glass to Lainie and when I opened the book there was my father’s handwriting-he had written my name and the date, 3/8/84. And reading brought that time back to me when my father gave me the book and read it to me. With my father not being with me any longer, to see something like that made me feel so happy because it was such a good memory. All just from signing a book. So true Maria! I am finding all sorts of books that my Mom gave me with messages inside and it is so great to have handwritten notes from her in the most precious package of a book! Thanks for reading and sharing! Thanks for the shoutnout, Maureen! And for the heads about about Barnes and Noble. You already know I often plan gifts around books. It’s one of my go to gifts! Love the blog. Congratulations! Thanks Nina – I know your Book Nook must be all green right now! Nina gives the best gifts that incorporate books – she gave my daughter Wemberly’s Ice Cream Star by Kevin Henkes with the cutest ice cream pajamas! 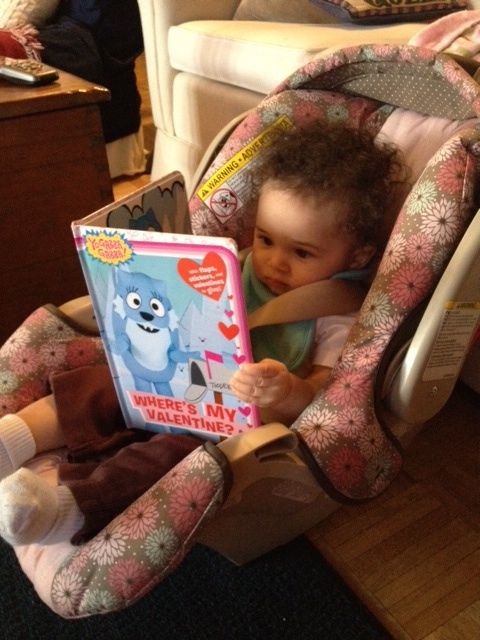 We love reading that book!